Yes, You Can Have a Cookie! Growing up I was a chunky only child who loved her food. Not just sweets - I loved, salty, fried, savory - everything! My mom is not the best baker and though has other amazing skills (sorry mom! ), baking is not one of them! I remember in the 80’s when baking a cake or cookies came right of the old Dunkin Hines or Betty Crocker box. On Saturday nights when my dad was at work, my mom and I would bake together. She’d whip out the box of Dunkin Hines, I would add the eggs and oil, then use the wooden spoon or our cute manual mixer. I loved that mixer; a little turn handle attached to a wheel. We would make chocolate chip cookies that night and watch the Saturday night lineup together. I miss those good old days. When I was on a mission to lose weight, I used to eat the lower calorie cookies because they were “healthier” for me. But honestly, they never tasted very good and I ate so many just to feel satisfied. I actually really hate the word “balance” and prefer “choice.”. When I think of balance, it’s usually like this: I ate like crap last night so I will balance it out and eat really well today. We all do it! Instead, I think it’s important to tune into what you’re feeling while you eat. How will the cookie make you feel after eating one and how will you feel after eating 10?!? If you don’t feel good eating it, then don’t! Now I make cookies made with full fat and organic ingredients and I don’t feel the slightest bit of guilt. I make them for occasions, for friends, or just if I have a cookie craving! I only need a few cookies to satisfy my cookie craving and I savor every bite. They are even better when I add the ice cream too! Ready to bake some amazing cookies? It’s cookie time! Now when I started baking cookies a few years ago, they never came out very good. I realized I was over mixing, not using quality ingredients and cooking them too long in the oven! After numerous tries and finding the perfect recipe, I stumbled upon one that I think is perfect! Preheat oven to 375 degrees and line a baking sheet with parchment paper or a baking mat. In a medium bowl, mix dry ingredients - flour, baking soda, baking powder, and salt; set aside. In a stand alone mixer fitted with a paddle attachment - I use a handheld, cream together butter and granulated sugar and brown sugar. Add vanilla and eggs one at a time and mix, scraping down sides of bowl as necessary. Mixture might look lumpy and that’s ok.
With the mixer on low-speed, slowly add the bowl of dry ingredients and mix just until dough comes together, it may be a little crumbly which is totally fine! You do not want to over mix the dough, otherwise the cookies can flatten when baked. Lastly, mix in chocolate chips. Place dough in refrigerator for 30 minutes - 1 hour to firm up. Dough will be pretty firm already, but cooled dough tends bakes better. 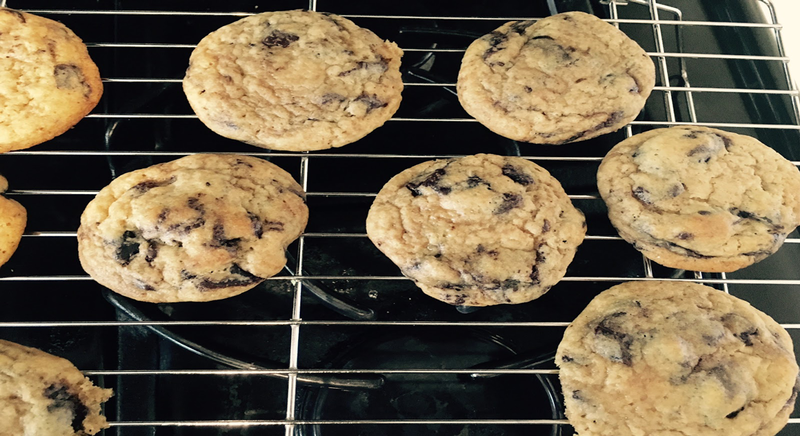 If the dough is too warm or sticky, the cookies may flatten out. Drop heaping spoonfuls of batter onto the baking sheet. Bake for 9-12 minutes (baking time will depend on oven) until edges are golden. Let cool on baking sheet for a few minutes then transfer to cooling rack. Use high quality ingredients – A good chocolate, organic sugar and eggs, grass-fed butter. You can really taste the difference in every bite. Refrigerate the dough for about an hour or more if you can help yourself– it helps bring the ingredients together and cookies won’t flatten as much (although I like flat cookies!). Under cook the dough! There’s a reason why they invented cookie dough ice cream - one of my favorites by the way. The cookies will still continue to cook when taken out of the oven. The trick is to cool them for a long time. I place them on a cooling rack after a few minutes out of the oven. Sometimes I just leave them on the sheet. Nice and chewy goodness!! !